Hi everyone! 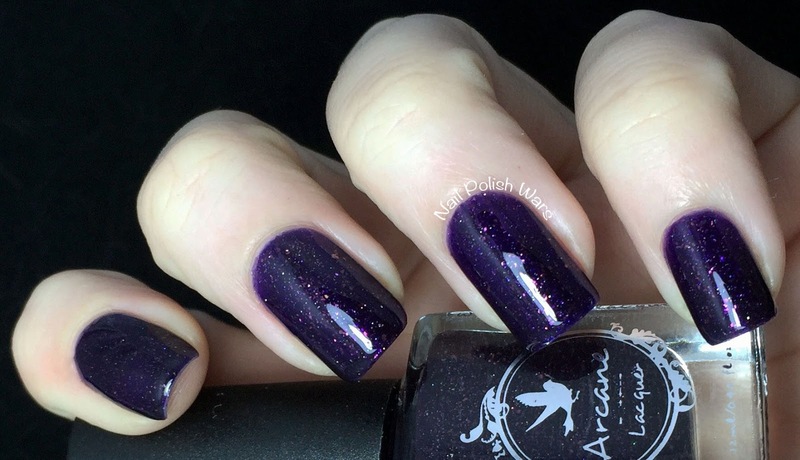 I have some Arcane Lacquer shades for you today! This was my first experience with this brand, so I was super excited to try them! 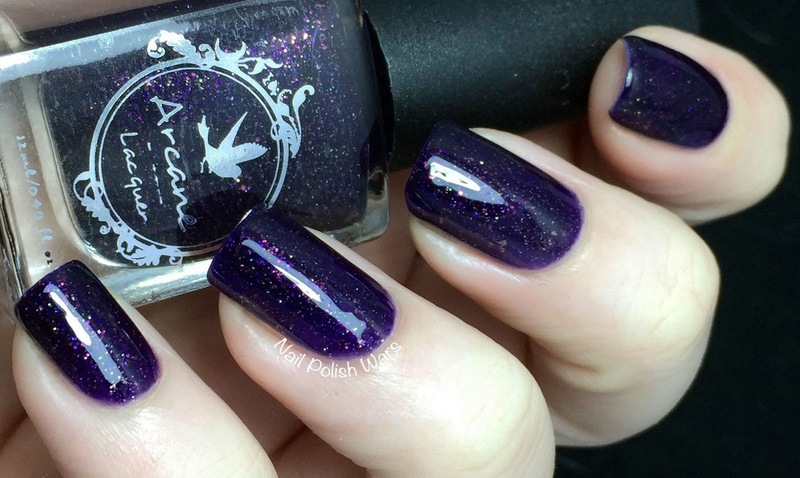 Catastrophic Scene is a deep purple jelly loaded with a plum and gold glass fleck shimmer. The formula was smooth and very easy to apply. 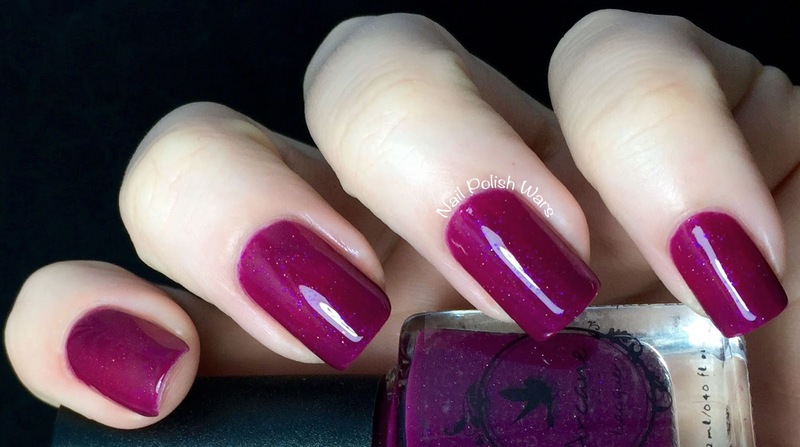 I really love how vampy this shade is! Shown is two coats of Catastrophic Scene. 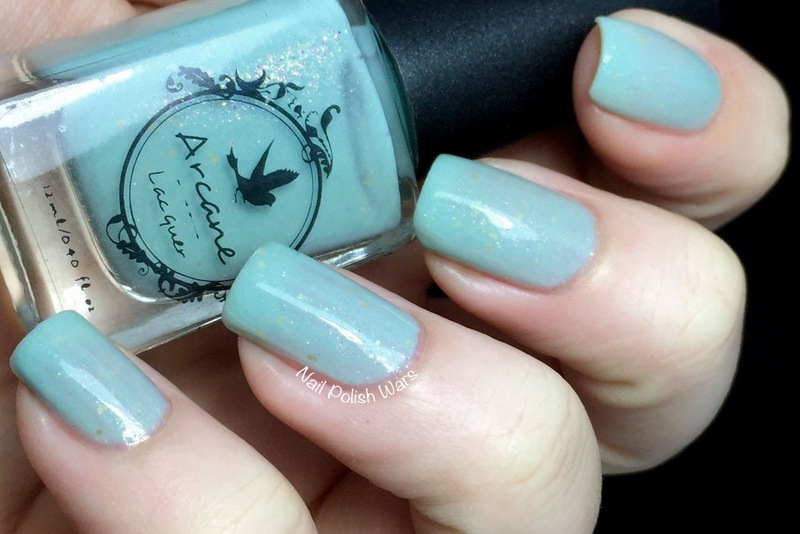 Come Back Around is a pale aqua crelly with gold glass flecks and a pink shimmer. The formula was a bit on the sheer side, and did require some finesse for a smooth finish. 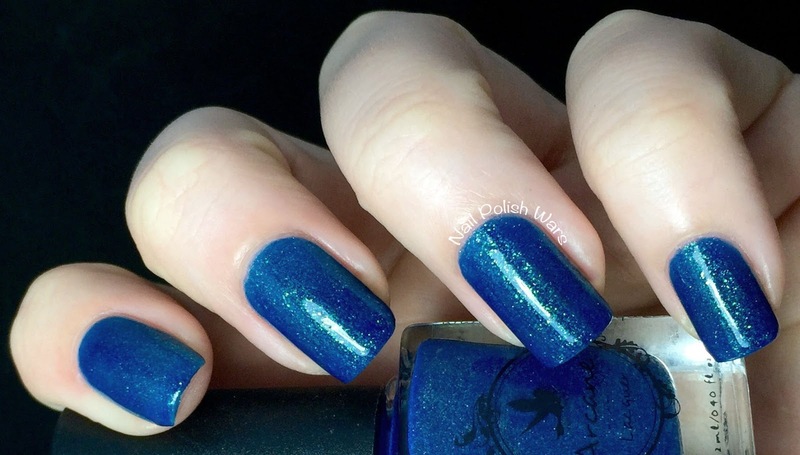 I just love this shade though! It's so shabby chic! Shown is three coats of Come Back Around. 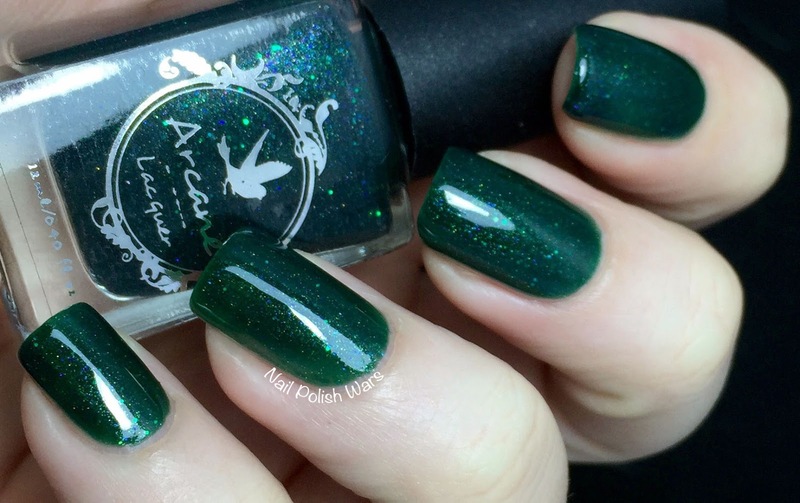 Fold the Corners is a deep green jelly loaded with holographic micro glitters and a teal shimmer. The formula was smooth and easy to apply. 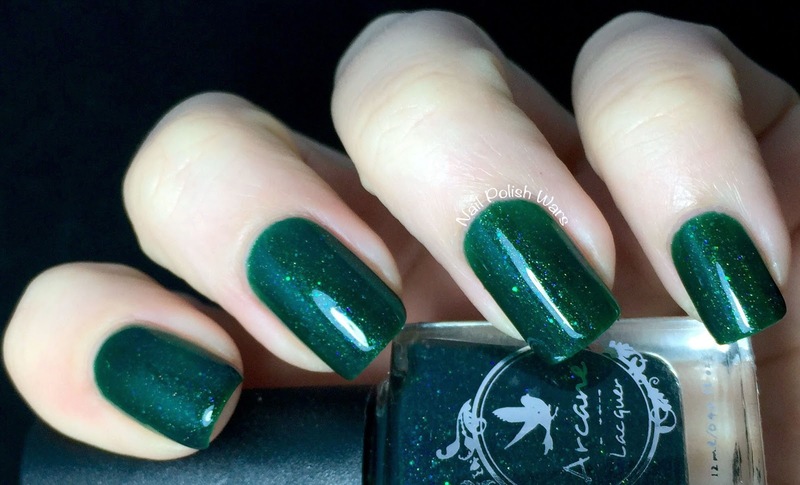 This is such a great jewel-toned shade! Shown is two coats of Fold the Corners. 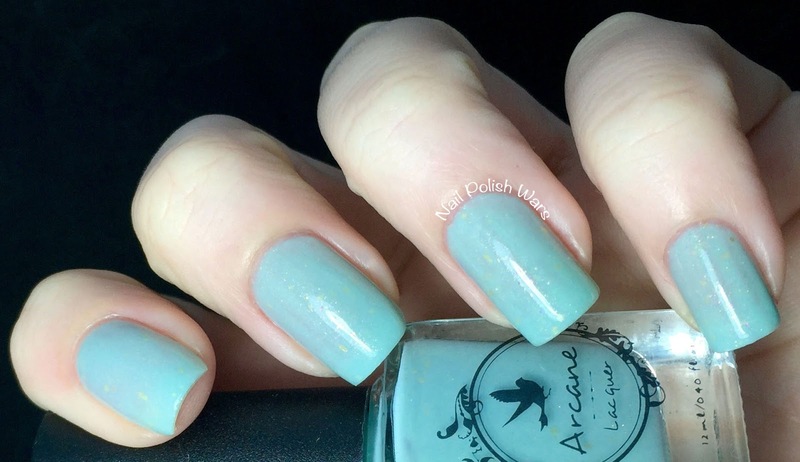 Grey Matter is a dusty lavender crelly with teal glass flecks and a pink shimmer. The formula was smooth and easy to apply. 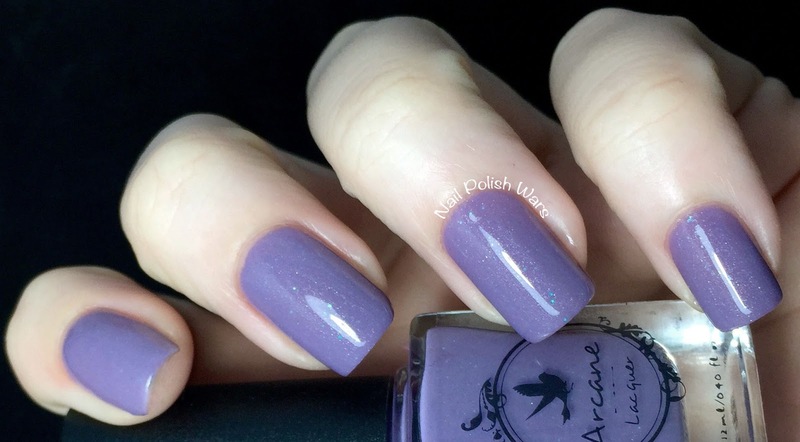 I loved this shade as soon as I saw it in the bottle, but I loved it even more on the nail! Shown is two coats of Grey Matter. 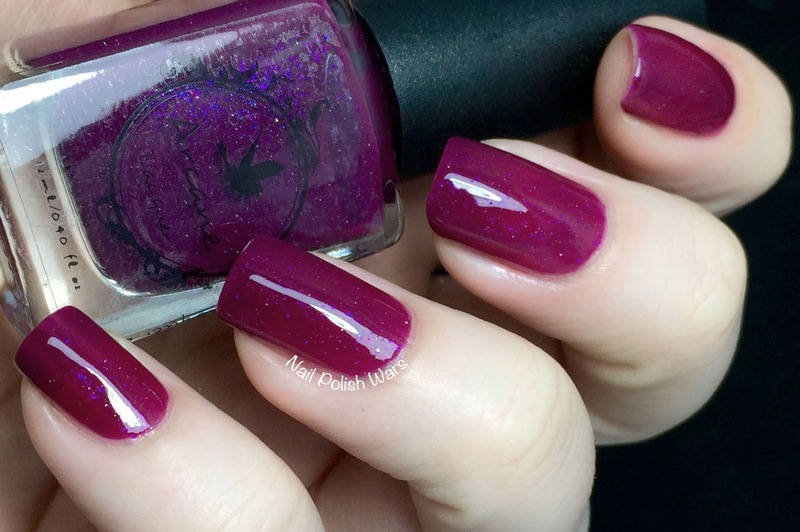 Passing Eyesore is a deep raspberry jelly with a magenta iridescent shimmer. The formula was smooth and easy to apply. 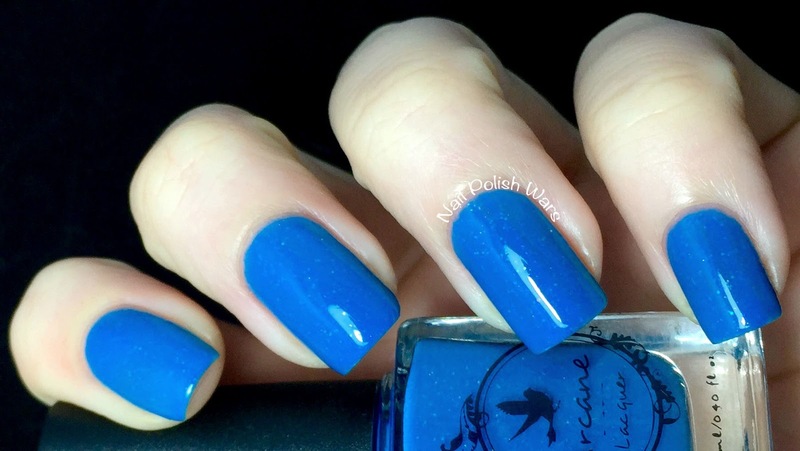 This is such a bold statement shade! I love it! Shown is two coats of Passing Eyesore. 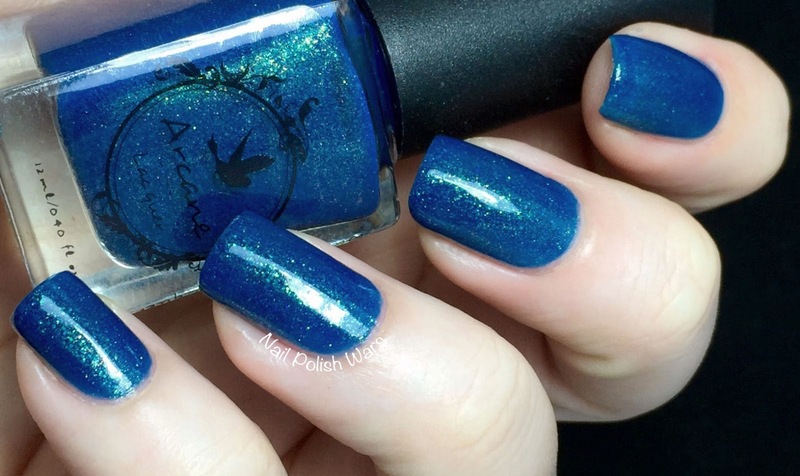 Poor Little Anti Saint is a medium blue crelly with a golden green shimmer. 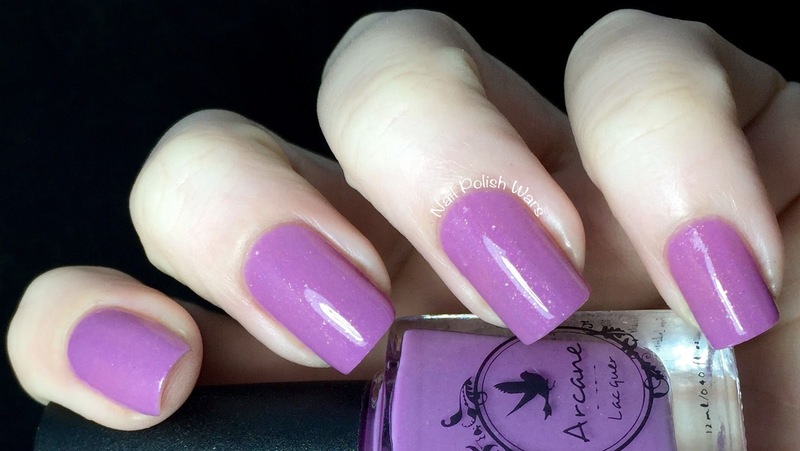 The formula was smooth and easy to apply, but did try to get a little patchy here and there. I like this shade, it has a stormy feel to it. Shown is two coats of Poor Little Anti Saint. 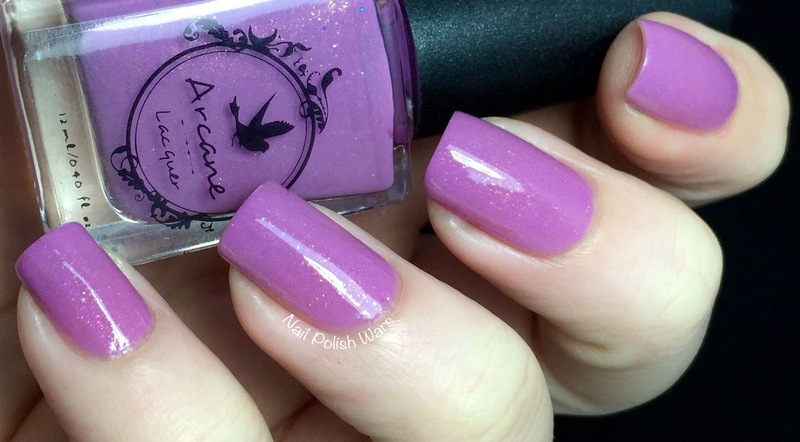 Straight Jacket Fashion is a lilac crelly with iridescent micro glitters and a gold shimmer. The formula was smooth and easy to apply. I just LOVE this one! It's so beautiful! Shown is two coats of Straight Jacket Fashion. 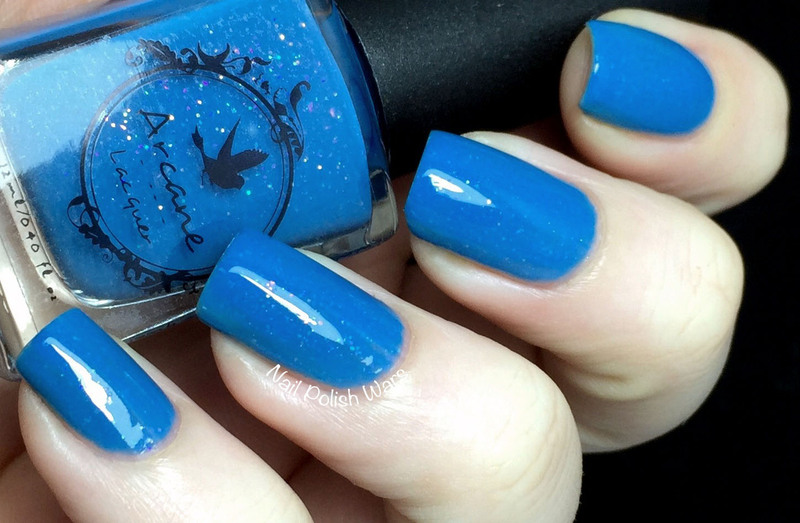 The Caustic Affection is a medium blue crelly with a gold and iridescent glass fleck shimmer. The formula was relatively easy to apply, but did go on a little thick, though it smoothed out nicely. I love the pop color feel of this one! Shown is two coats of The Caustic Affection. 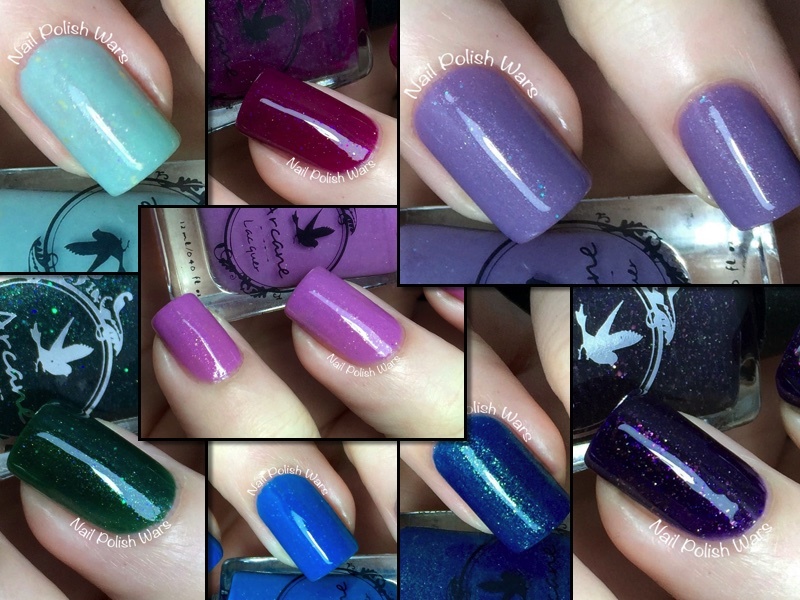 You can find these and other Arcane Lacquer shades at their storefront here, and be sure to check them out on Facebook for all of their latest collections and updates. What great swatches of these colors. There nice.